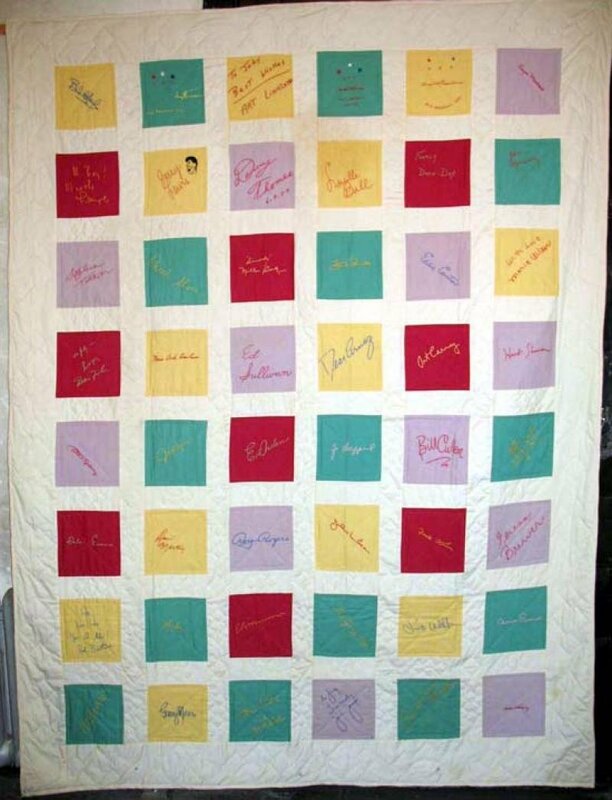 A young girl with Muscular Dystrophy collected all the signatures by sending cotton squares to celebrities seeking their autographs, then her church group embroidered over the names to preserve them and finished the quilt. She was one of the first of "Jerry's kids" who participated in his earliest TV telethons to raise money for research. Among the signers: United States Presidents and their wives- Eisenhower, Truman, Hoover and one other I think, and so many celebrities who reigned at the beginning of the television age - hosting or appearing on programs which are now nostalgic memories of that pioneering era in the 1950s. Garry Moore, Steve Allen and Jayne Meadows, Jerry Lewis and Dean Martin, and many more - I will post a list. Cotton in various solid colors still in wonderful condition.